The Erie SeaWolves may be a Detroit Tigers affiliate, but that isn't stopping them from embracing the pirates. The SeaWolves, members of the Double-A Eastern League since 1999, unveiled a new set of largely nautical-themed logos on Thursday evening at a press conference held at Erie's Bel-Air Clarion Hotel. The team's primary logo updates the look the team that the team had previously sported: an eye patch-wearing wolf smirking beneath two crossed bats (which now double as swords). This logo is augmented by a bevy of secondary marks, most of which celebrate the team's long-standing nautical and pirate theme. The black home and away caps feature the wolf sporting a bandana, for example, while the red batting practice caps showcase this sartorially ambitious Canis Lupus in a black pirate's cap. 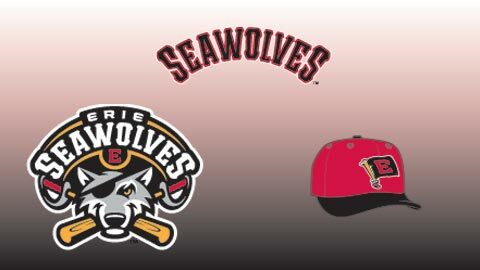 Team president Greg Coleman acknowledges that the SeaWolves could have gone in for a total identity overhaul, given that Erie is located on a lake (as opposed to the sea) and hasn't been a Pirates affiliate since 1998. (It was this long-gone affiliation that prompted the SeaWolves name in the first place). But Coleman is quick to cite the time-honored Minor League maxim, "It doesn't have to make sense, it just has to be fun." "There are 18 years of brand equity with the SeaWolves name, and we wanted to keep that," elaborated Coleman. "We could have gone in the opposite direction, but instead we chose to embrace our inner pirates." The new logos were designed by Dan Simon of Louisville-based Studio Simon, a leading Minor League logo designer whose work Coleman was familiar with. "Dan and I had worked on a number of projects before, when I was with the Modesto Nuts and also the Trenton Thunder, so this was a natural fit," he explained. "Dan had a number of ideas. We thought it would be good to examine and expand upon just what a SeaWolf could be." The SeaWolf doesn't appear in all of the new logos. One of the secondary marks, which will be available as an alternate cap, features an "E" flag flying from a baseball bat pole and Coleman remarked that this has a local tie-in that might not be readily apparent. Erie is known as the Flagship City, which references its role as the site of several important 19th century naval victories. "That's a little bit of a homage, and not an obvious one, to the role that Erie played in the War of 1812," he said. "That's something that is fondly looked upon here." Such regional references are common in Minor League Baseball, where, when it comes to logos, teams aim to have the best of both worlds. "We're going for both local relevance and national appeal," said Coleman. "We want to have something for everybody."